The 1967 Arab-Israeli War rocketed the question of Israel and Palestine onto the front pages of American newspapers. Black Power activists saw Palestinians as a kindred people of color, waging the same struggle for freedom and justice as themselves. Soon concerns over the Arab-Israeli conflict spread across mainstream black politics and into the heart of the civil rights movement itself. Black Power and Palestine uncovers why so many African Americans--notably Martin Luther King, Jr., Malcolm X, and Muhammad Ali, among others--came to support the Palestinians or felt the need to respond to those who did. Americans first heard pro-Palestinian sentiments in public through the black freedom struggle of the 1960s and 1970s. Michael R. Fischbach uncovers this hidden history of the Arab-Israeli conflict's role in African American activism and the ways that distant struggle shaped the domestic fight for racial equality. 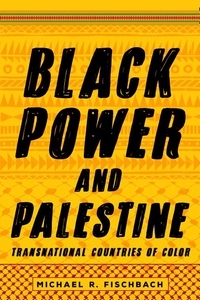 Black Power's transnational connections between African Americans and Palestinians deeply affected U.S. black politics, animating black visions of identity well into the late 1970s. Black Power and Palestine allows those black voices to be heard again today.